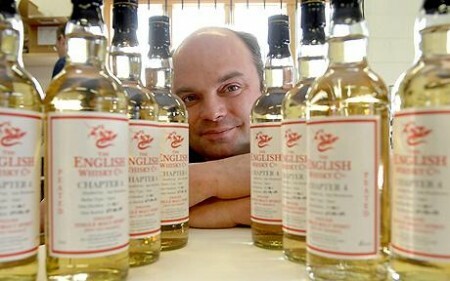 English Whisky you say? Yep, and it is not the only one but the first of this new wave of world whiskies. St. George distillery is located at Norfolk, England and has been producing whisky since 200(6?). Yet another one jumping in the whisky wagon? Well, so I thought until I tasted it. My first experience with St. George Whisky was with their peated spirit ( not yet whisky! ) Chapter 4. I did a tasting of several Ardbeg and I wanted to start with something soft and light and Kaboom!. The little Chapter 4 almost eclipse the peat punch of Ardbeg. St. George English Whisky Chapter 14 bottled at a whooping 58.8% ABV. No hostages! Nose (85): more than average. floral, citrus, honey, vanilla. Palate (89): powerful, oily. honey, vanilla, fruity, pears. Finish (88): longer than average. honey, fruity. So based on other whiskies I have already tasted I rate this English Whisky Chapter 14 - Cask Strength with 87 points over 100. This one has one of the best labels I have seen in the last years in a whisky bottle. I liked it so much that I bought it completely blind. Described as both'fun and serious', St. George's distillery's dragon-themed English malt whisky Chapter 13 was launched at 1pm on Friday 13th September 2013. Bottled at 49% (because 4+9=13), this is an intensely-flavoured sweet and spicy whisky with one of the coolest labels you'll see. Nose (86): more than average. smoke, honey, vanilla, fruity. Palate (89): powerful, oily. peat, fruity, honey, vanilla, spices, wood. Finish (88): longer than average. wood, honey. So based on other whiskies I have already tasted I rate this St. George's Distillery Chapter 13 English Single Malt Whisky with 88 points over 100. Peated whisky at cask strength? Can you ask anything else? First released in November 2013, this is the 15th'chapter' in The English Whisky Company's history and the peated sister of chapter 14. The first release of a 5 year old whisky from the distillery, this has a wealth of fruit flavours to balance the young peat. Nose (89): more than average. floral, citrus, honey, vanilla, wood, spices, peaches. Palate (90): powerful, oily. honey, floral, peat, spices, vanilla, apples. Finish (90): longer than average. honey, apples. So based on other whiskies I have already tasted I rate this English Whisky Co. Chapter 15 / Heavily Peated English Whisky with 90 points over 100. And well, to complete the round a single cask, cask strength english whisky. Palate (90): powerful, oily. honey, floral, fruity, wood, spices, cocoa. So based on other whiskies I have already tasted I rate this English Whisky Co / Founders Private Cellar / Cask 0787 with 90 points over 100. This whisky is simple awesome. It is a real pity it is priced so expensive because it would serve quite well to the distillery name.